Bollywood actress Kajol was among the many celebrities who attended Soundarya Rajinikanth and Vishagan Vanangamudi's wedding reception in Chennai on Monday. 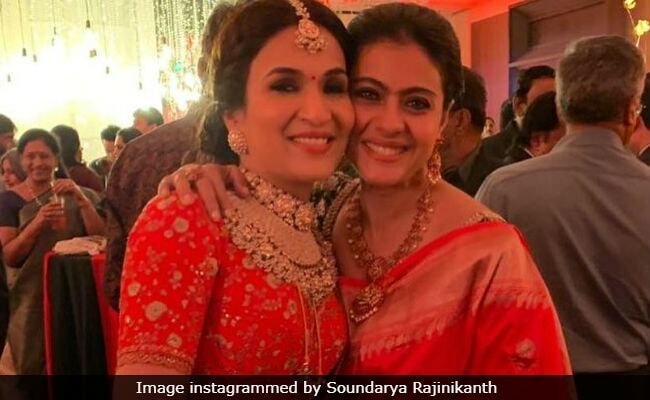 Kajol, who returned to Tamil cinema after two decades with Soundarya Rajinikanth-directed Velaiilla Pattadhari 2 or VIP 2 (2017), shared a picture of herself with the bride, from the post-wedding reception party. "A VIP wedding... Wishing my sweet director a wonderful life ahead." Kajol's VIP 2 co-star was Soundarya's brother-in-law Dhanush (married to Rajinikanth's elder daughter Aishwaryaa). Kajol looked vibrant in a red banarasi saree festooned with temple jewellery while Soundarya Rajinikanth looked stunning in a red outfit accessorised with a heavy gold choker. South actress Lakshmi Manchu, daughter of Mohan Babu, also attended the wedding festivities with her family. She posted a selfie with the bride and wrote: "And a lifetime of bliss my darling." This is Soundarya Rajinikanth and Vishagan Vanangamudi's second marriage. Soundarya was earlier married to businessman R Ashwin, with whom she has a three-year-old son Ved while Vishagan was married to Kanikha Kumaran, a magazine editor. Soundarya Rajinikanth is also a graphic designer and has worked on film like Chandramukhi, Sivaji and Kochadaiiyaan - all starring her father. Apart from owning a pharmaceutical company, Vishagan Vanangamudi is an actor and he was recently seen in Vanjagar Ulagam.